The B-vitamins or B-complex are commonly known as brain vitamins. They are mostly water soluble and essential, meaning the body doesn’t manufacture B-vitamins and depends on outside sources for vitamin-B nourishment. Proper vitamin-B nourishment supports the brain and central nervous system. There are eight B-vitamins. It’s best to consume green leafy plant foods to obtain most B-vitamins from food sources. But vitamin B-12 is not one of them. It can be obtained from animal sources or supplements. As we grow older, metabolizing vitamin B-12 becomes more difficult. Most of the B-complex vitamins are co-factors with cellular mitochondria ATP production. Mitochondria are the cells’ energy engines that also monitor DNA activity. It can’t get much more basic than that. This article will focus on vitamin B-12, a very important undervalued B-vitamin. Vitamin B-12 (cobalamin) is the only B-vitamin that doesn’t have a plant source. It’s created from bacterial activity in the gut while processing meats, dairy, and eggs, according to currently accepted dietary guidelines. Deficiency can lead to anemia, hair loss, dementia, and other manifestations of neurological damage if not overcome. Deficiency symptoms may start with fatigue, weakness, or mild depression, but if not handled may seriously mimic Alzheimer’s, MS, Parkinson’s, fibromyalgia, or diabetic neuropathy. Vitamin B-12 deficiency also allows homocysteine build-ups. High homocysteine is considered a valid marker for impending cardiac arrest. The KPNC study determined an association of using acid reducing pharmaceuticals, PPIs or proton pump inhibitors to vitamin B-12 deficiency even among meat, egg, and dairy consumers. It’s appropriate to assume that over the counter antacid tablets have the same adverse effect. Why? Dr. Jonathon Wright, M.D., founder of the holistic Tahoma Clinic in Tukwila, Washington, is adamant that digestive issues of heartburn, acid indigestion, and GERD (gastroesophageal reflux disease) are mostly due to insufficient stomach acid and disturbed gut microbiomes from poor diets and antibiotic use. According to Dr. Jonathon Wright, M.D. of the holistic Tahoma Clinic in Tukwila, Washington, you need high levels of stomach acid to begin the process of extracting vitamin B-12 from food or even orally ingested B-12 supplements. He recommends supplementing with HCL (hydrochloric acid). Align Life Clinic founder Dr. Joe Esposito, DC, recommends a small solution of apple cider (organic) vinegar in water before each meal. Both recommendations are often necessary from age 40 or more and on. Then there is the gastric intrinsic factor (GIF) that binds with B-12 to release it into the last phase of absorption into the blood. Intrinsic factor is a protein produced by a type of specialized cells that line the stomach wall known as parietal cells. Intrinsic factor value testing can determine if you’re equipped to metabolize B12. During digestion, stomach acids release vitamin B-12 from food or oral supplements. This process binds the B-12 to form a complex that enables the gut to generate final blood absorption via the small intestines. Both stomach acid production and intrinsic factors decline with age, impeding B-12 metabolism. Some medical experts advocate urine testing for methylmalonic acid (MMA) over blood testing for B-12. If B-12 cellular metabolism is low, MMA readings will be high. Another indication of low B-12 metabolism is high blood homocysteine levels, which is also a marker for serious heart problems. These testing requirements may disprove the standards of blood level B-12, since even if it’s in the blood according to what is considered sufficient, it may not be getting metabolized properly in the tissues’ cells. The blood level B-12 readings can be very unreliable. An out of the box doctor in Great Britain took liberties with the conventional considerations of adequate blood levels of B-12, and the medical bureaucrats gave him a hard time even as he cured patients who were wheelchair bound with massive doses of B-12 injections. How he handled that was heroic. He was subsequently publicly hailed as a “local hero” in 2013. There are ways to bypass the digestive system completely and resolve all those absorption issues recently discussed. Even if you can’t get testing done, you needn’t worry about overdosing B-12. It’s not a serious threat or likelihood. The most obvious way to circumvent the GI tract is what Dr. Chandy used in the video above, injection. In the USA, doctor visits for B-12 shots can be pricey. Better to get a prescription for injectable liquid B-12 with some disposable syringes and hypodermic needles to inject yourself. Not so easy for most. But there are other ways to get B-12 working inside you. 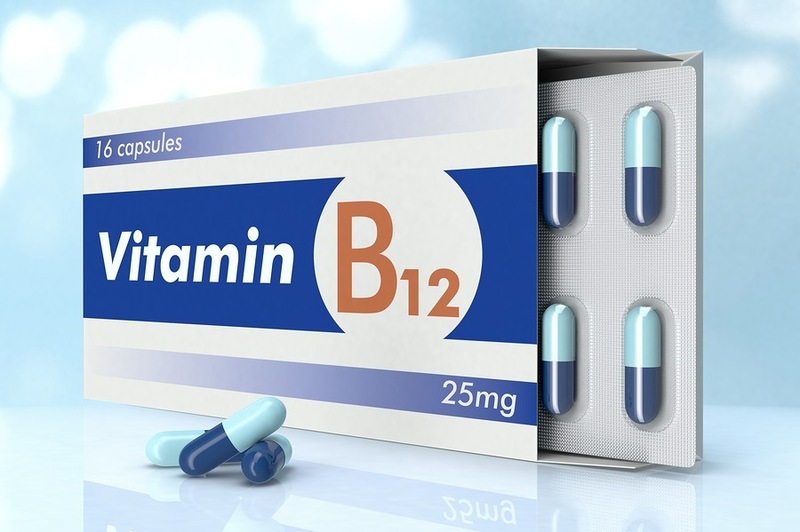 There are over the counter sublingual B-12 products exhibiting two types of B-12: Cyanocobalamin and methylcobalamin. Cyanocobalamin is cheaper and more commonly used by vitamin pill manufacturers and food manufacturers to fortify nutritionally vapid processed foods. It contains a cyanide molecule which has to be processed out and nullified before the cobalamin is left to provide B-12. Methylcobalamin doesn’t need that process. It is more like the biologically pure B-12 in foods, and the methyl it contributes is something the body can usually use. It is the preferred, less common, slightly more expensive version of B-12. Other delivery techniques include B-12 patches and liposomal B-12. Liposomal encapsulation technology (LET) encapsulates vitamin molecules in tiny lipid (fat) molecules that protect the encapsulated vitamins from stomach acids. Yet they are small enough to enter through lipid cell walls, making the process of cellular delivery direct and uncomplicated. You will find most over the counter B-12 vitamin products also contain folic acid, a form of B-9 that some highly qualified health experts consider unsafe for human consumption. Vitamin B-9 helps B-12 produce more red blood cells to prevent or overcome anemia. But it’s better to avoid the folic acid version and seek out B-12 vitamins without folic acid or use one with folate, the natural safe form of B-9. Supplementing B-12 effectively does require letting the other B-vitamins, B1,2,3,5,6,7 and 9 chip in as a foundation for optimal B-12 absorption. Seek out naturally sourced B-complex products, or use bee pollen, or unfortified nutritional yeast for a daily intake of this water soluble vitamin complex. Tagged alzheimers, B-12, brain health. Bookmark the permalink.